The Stevie® Awards held one of its awards galas for its 12th annual American Business Awards competition on Friday night, and announced the winners of its Grand Stevie Award trophies. Quality Systems of Irvine, CA received the Grand Stevie for organization of the year, for earning the most award points in The 2014 American Business Awards. Other top ABA Grand Stevie winners include Makovsky for interactive services agency of the year, Slack and Company for marketing agency of the year, and MWW for public relations agency of the year. This is the second year in a row that Makovsky, Slack and Company, and MWW have won those awards. The Grand Stevie Awards were presented to the organizations that submitted the best body of entries to The American Business Awards this year, in their own name or in the names of one or more clients. The organizations with the most points won, with a Gold Stevie Award win counting for three points, a Silver Stevie win for two points, and a Bronze Stevie win counting for 1.5 points. Friday’s gala, focused on new product awards, website awards, and other tech awards, was the second of two American Business Awards ceremonies this year. The first ceremony took place in Chicago on June 13 and honored winners in disciplines such as customer service, human resources, corporate communications, live events, publications, and selected categories for company/organization, management and marketing. More than 260 executives attended Friday’s event at San Francisco’s Palace Hotel. Stevie Awards were conferred in three levels of distinction: Gold, Silver and Bronze. See the blog post issued earlier today for a summary of the other Stevie Award winners. 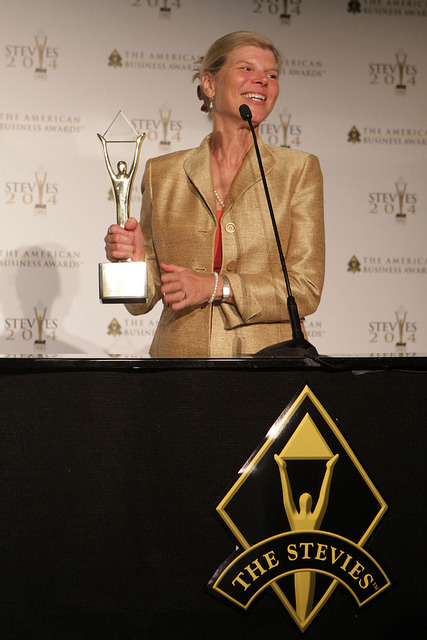 For a complete list of all 2014 American Business Awards’ Stevie Award winners visit www.StevieAwards.com/ABA.